One of the most useful French phrases that beginners and travelers should learn is “je voudrais...”. This little phrase can be used when you’re out in restaurants ordering food or drinks, or in everyday conversations when you need to to ask for something or make a little polite request. In this lesson, you’ll learn how to use “Je voudrais... “ as well as try some examples. The full lesson for this topic which includes several audio tracks, sample dialogues with transcription, plus writing and listening exercises can be found in the book My French Routine Volume 2. You can check it out below. “Je voudrais…” simply means, “I would like…” This will let the other person know what you would like to do, know, or have. We follow “Je voudrais” with a noun or infinitive. You can practice how to pronounce “je voudrais..." with this short video. “S’il te plait/s’il vous plait” is an expression that literally translates as “if it pleases you,” but it is generally used to mean “please” in French. “S’il vous plait” is the extremely polite version and is used in formal situations or with people you do not know. “S’il te plait” tends to be used in less formal situations and with people you know. Just as in English, this expression should be added at the end of a request. Je voudrais un café, s’il vous plait.➝ I would like a coffee, please. Let’s see how “je voudrais..” can be applied in a sample dialogue. The audio for this dialogue can be found in the book My French Routine Volume 2 which you can get here. Want some more examples? Well, here you go. .
Je voudrais un gâteau, s’il vous plaît. - I would like a cake, please. Je voudrais acheter ce livre, s’il vous plaît.- I would like to buy this book, please. Je voudrais réserver un ticket, s’il vous plaît. - I would like to book a ticket. Je voudrais un thé, s’il vous plaît. - I would like a tea, please. 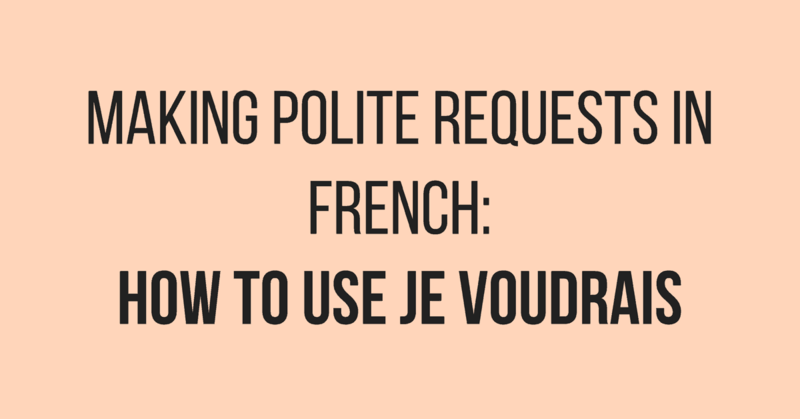 Now you know how to use the common and very useful phrase “Je voudrais…” when making polite requests in French. You also learned how to use “s’il vous plaît” or “s’il te plait” after each request. Do you want more short lessons like this? You can get more daily lessons together with exercises and lots of audio support with My French Routine learning series. We have volumes 1 - 6 available which caters to all levels from complete beginners to advanced level learners. Check it out below.